The 309-118 vote sends the bill to the Senate in time for them to act to avert a government shutdown. THE US HOUSE has passed a $1.1 trillion governmentwide spending bill, awarding wins to both Democrats and Republicans while putting off until later this year fights over President Donald Trump’s promised border wall with Mexico and massive military buildup. The 309-118 vote sends the bill to the Senate in time for them to act to avert a government shutdown at midnight Friday. The White House has said Trump would sign the measure, which is the first major legislation to pass in Trump’s short, turbulent presidency. House Speaker Paul Ryan praised the measure as bipartisan, and said the biggest gain for conservatives came as Democrats dropped longstanding demands to match Pentagon increases with equal hikes for nondefence programs. Democrats also backed the measure, which protects popular domestic programs such as education, medical research and grants to state and local governments from cuts sought by Trump — while dropping from earlier version a host of GOP agenda items. The bill is the product of weeks of Capitol Hill negotiations in which top Democrats like House Minority Leader Nancy Pelosi successfully blocked Trump’s most provocative proposals — especially the Mexico wall and cuts to popular domestic programs like community development grants. The opinions of top party leaders were not shared by everyone in the rank and file, some of whom feel that GOP negotiators too easily gave up on conservative priorities, such as cutting funds for Planned Parenthood and punishing “sanctuary” cities that fail to cooperate with immigration authorities. “I don’t think it was negotiated very well, and I’ll just leave it at that,” said Rep. Jeff Duncan, R-S.C. 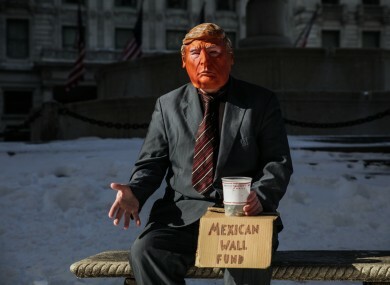 The long-overdue bill buys just five months of funding while Trump and his allies battle with congressional Democrats over spending cuts and funding for the wall, which Trump repeatedly promised during the campaign would be financed by Mexico. Mexican officials have rejected that notion. Republicans were surprised by tweets from Trump yesterday that suggested he was initially unhappy with the measure and might provoke a government shutdown this fall in hopes of getting his way on the wall and other demands. Email “Trump's wall put off until later this year as US politicians pass $1.1 trillion spending plan”. Feedback on “Trump's wall put off until later this year as US politicians pass $1.1 trillion spending plan”.